05 Dec 2018 --- Newer high-intensity sweeteners such as sucralose and stevia are increasingly challenging more established high-intensity stalwarts, such as saccharin, cyclamate, aspartame and acesulfame-k, within the sweetener category. New data shared in a Rabobank report notes that over the period 2009 to 2019, newer sweeteners volume grew at a rate of 12 percent a year, while traditional ones were almost flat at 0.6 percent. Rising concern about obesity and diabetes as well as government-imposed pressure has thrown the spotlight on sugar consumption, which in turn, has boosted the sugar substitute market. The scene has been set by the recent trend toward sugar reduction in beverages and food products. The complexity around replacing sugar is spurring continuous innovation, as well as requiring blends of different products. “So far, there has been no development of a single ‘magic bullet’ solution that provides an ideal direct substitute for sugar,” the report notes. 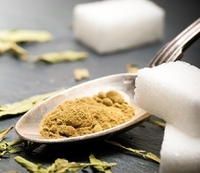 As sugar reduction emerges as a key pillar for a host of companies, allulose and next-generation stevia extract are among the sweeteners that hold particularly strong future potential, Ruud Schers, Analyst at RaboResearch Food & Agribusiness, Sugar, Rabobank, tells FoodIngredientsFirst. 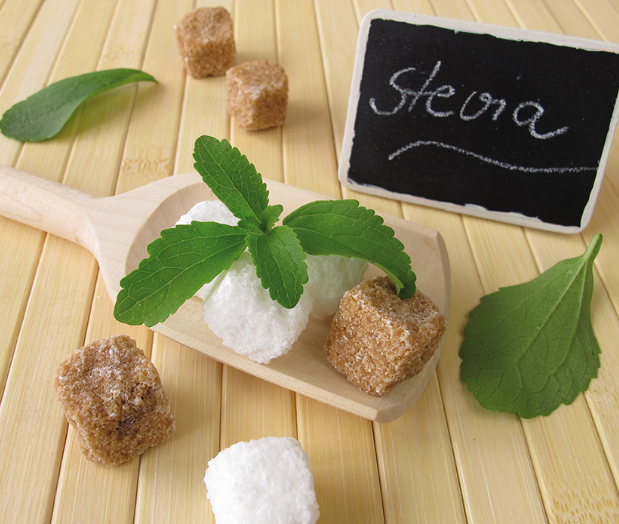 Natural sweeteners, such as stevia, have been trending amid the clean label boom and this is expected to continue. The category has been boosted by high-profile partnerships such as a collaboration between DSM and Cargill. The two ingredient powerhouses announced plans to form a new sweetness joint venture known as Avansya last month. Together, the companies will produce highly sought-after, sweet-tasting molecules, such as steviol glycosides Reb M and Reb D, which are produced through a fermentation process. “ Click to EnlargeNewer sweeteners volume grew at a rate of 12 percent a year over the period 2009 to 2019, while traditional ones were almost flat at 0.6 percent. 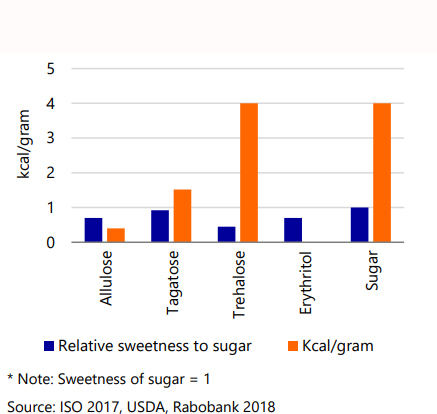 Credit: Rabobank Carb-itrage report.Apart from the taste of the new varieties, the key target with stevia is to make the distinction in how you will be able to scale up and get production costs down. If you have two companies teaming up on the fermentation side of things, that is one part of the story. The other side is how the companies are positioned vis-à-vis the food companies. If you want a successful sweetener, it’s important to work with such companies to try out different things to see what is successful. In this partnership, you are ticking both these boxes,” says Schers. Indeed, the search for a “magic bullet” sweetener plays to the strengths of ingredients companies that offer a portfolio of substitution solutions and who are working in close collaboration with food sector clients. Allulose may not be as high-profile as stevia, but this does not inhibit how Schers believes it will perform in the future. Allulose exists in tiny quantities in nature. It can be found in foods such as figs, raisins, molasses and maple syrup. Suppliers include Matsutani and Tate & Lyle. According to Innova Market Insights data, allulose as an ingredient is still very niche. The number of new food & beverage launches tracked with the sweetener increased by +267 percent in 2017 compared with 2016, but this is from an incredibly small base. “Allulose ticks several boxes when it comes to the traits that replacements should have, such as regulatory approval, costs and performance. It's on the market in a few countries, but there are still some approvals pending in Europe, so it will take some time to reach here,” notes Schers. One such company is German start-up Savanna Ingredients GmbH, which is producing initial quantities of allulose. However, a key factor to consider is how allulose will feature on product labels – will it be labeled as added sugar or something else? This, of course, will determine a lot for its future in the global market. Click to EnlargeSweetness and calores of selected low-intensity sweeteners, compared to sugar. Credit: Rabobank Carb-itrage report. “Consumers are different around the globe, but in the US, when they look at the label, all they want to see is calories and added sugars. While EU consumers may look more for clean label, these are all things that of relevance,” notes Schers. “One reason why the pick-up for monk fruit may be slower than other sweeteners is the cost. It’s costly per unit at this moment, but you have several companies looking at how to increase scale and get production costs down. I would watch this one though. It could be a game-changer for certain categories. But the cost is going to be a challenge,” Schers further explains. Paul Paslaski of MonkFruit Corp – a company that accounts for about 58 percent of the world’s supply of monk fruit sweeteners – told FoodIngredientsFirst in an interview at HiE 2018 in Frankfurt, Germany last week, that the company is excited about the introduction of monk fruit to the EU market. Regulatory approval in the bloc is likely next summer. “Monk fruit will come in as a fruit concentrate, between 10 and 20 times as sweet as sugar. It will be more akin to what you would expect from honey and sugar, but without the calories. In the US, we have been pleased with the results from the dairy space, for example. It also performs well in beverages and we are also selling it in baked goods and cereals. It’s suitable for a range of applications,” says Paslaski. He is also optimistic about future consumer acceptance of the sweetener as its status as a fruit means it's an easy leap for most consumers to understand why its sweet. Furthermore, Layn Europe has been working on the dossier for monk fruit for almost a year, and the company reported feeling optimistic to FoodIngredientsFirst at Vitafoods Europe in Geneva earlier this year. “We are hoping to give good news to the industry within the year. The feedback we've had so far is positive, in the US and China, it has already been certified. We do see potential in different industries, such as beverages, it has a good taste profile and natural sweetening power. We can also apply in ice cream and bakery,” noted Luca Pennestri, of Layn, at the show. How sweeteners show up on labels, as well as their costs are key “traits” that must be considered of all sweeteners. As Schers explains, to be successful these days, any sugar substitute must perform well against key criteria such as taste and functional properties, regulatory approval, cost and label-friendliness. New sweeteners growth at the expense of old sweeteners? As well as potentially substituting current caloric sweeteners, such as sugar and high fructose corn syrup, used in food & beverages, a new sweetener product or technology with superior characteristics could also substitute mainstream or traditional alternative sweeteners. As previously noted, Rabobank data has shown that newer sw Click to EnlargeNatural sweeteners, such as stevia, have been trending amid the clean label boom and this is expected to continue.eeteners are growing faster than traditional ones. To put it into perspective, the global market for high-intensity sweeteners grew by 2.7 percent annually, which is a somewhat higher rate than that of global sugar consumption. “I think that one of the big misconceptions in the market is that if we have new alternative sweeteners such as stevia or allulose, then it will be at the expense of sugar. But really, it's at the expense of the older sweeteners too,” says Schers. In this way, the data demonstrates what a huge impact the current sentiment around sugar has had on the use of traditional sweeteners, new sweeteners and sugar itself. One driving force behind the renewed focus on sugar reduction and, therefore, sugar substitutes, has been government implementation of extra taxation on high-calorie drinks and foods, such as in the UK, Ireland and Mexico. The UK's sugar tax came into force in April, and hopes to cut sugar consumption levels among the population, in turn leading to lower obesity rates and healthier consumers. Cutting the number of people who are overweight or obese by one per cent each year by 2035 could potentially avoid around 64, 300 cancer cases, notes Cancer Research UK. “In the UK, it had a significant impact on the reformulation of beverages in order to stay in the lower tax category. Producers are looking at how we can cut back on sugar and what other products come into play,” notes Schers. “Here, you see the older sweeteners pop up more and more, especially in beverages. This is good in terms of calories and regarding cost, it’s attractive because the older and high-intensity sweeteners are cheaper than sugar. But, the third part of the equation is that a consumer willing to have lower calories may then be receiving other ingredients – are they aware of this? The taste also changes,” he stresses.